Rarely is Thai cuisine prepared by following a recipe. The most important ingredient in every dish is the chef putting him or herself into the creation—it truly is a work of love. In my quest to eat at every Thai restaurant in the Salt Lake Valley, I have enjoyed finding variations of flavor and spiciness at each establishment. Some dishes stand out; others melt into the background. One dish that reigns supreme is tom yum gai: a hot & sour soup with chicken, mushrooms, lime juice, kaffir lime leaves, lemon grass and spicy Thai chilies. Some prefer this as an appetizer; I love it as a meal. 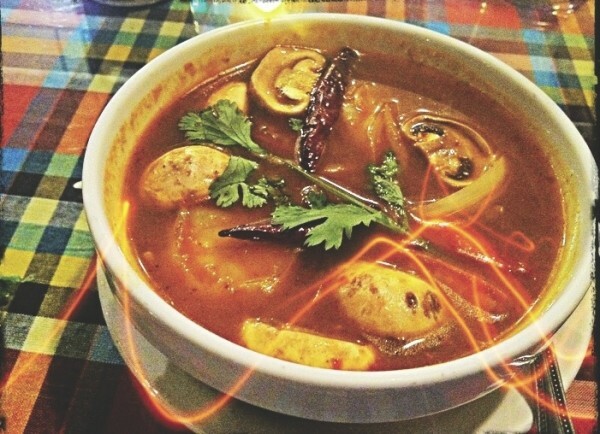 Three restaurants feature a tom yum gai that calls to you from afar. The runners-up are Sala Thai Kitchen and Siam Orchid, but the gold medal goes to Pawit’s Royale Thai in Holladay. Here, a shrimp essence is added to the tom yum gai, giving it a powerful seafood flavor. There is also quite a helping of spicy Thai chilies—more than most, because the soup definitely has some fire. If the perfect mixture of lime juice and spices is met, it will make your mouth water with excitement. The kaffir and lemon grass give the tom yum gai a nice herb flavor, one that stands out as exotic. As for the mushrooms and chicken, they absorb all the flavors and add substance to the soup. When a bowl of tom yum gai is placed in front of me at Pawit’s Royale, a majestic experience begins. I savor every second as the aroma floats gently upward. I gaze with admiration as the chicken and veggies glide through the beautiful broth. It’s a moment when time stands still. Many people plan lunch around their schedule; I prefer to plan my schedule around lunch. When that lunch is a date with tom yum gai, life is good. There are even many nights (no joke) when I wake up in a cold sweat craving this soup.